You can pay ConnectReseller by using your PayPal account, our PayPal ID paypal-us@ownregistrar.com. Send across duly filled in PayPal Authorization Form along with photo identity proof. Documents that can serve as a photo identity proof are Passport; State/Government issued ID, Valid Driver’s license or any other document carrying national significance. Create a Request under the “Billing” department with the details viz. Name, Customer ID, Invoice ID etc and attach the required documents. In case you have already made the Payment through your Unverified Account, then too you need to mention Date of payment, description of transaction and amount. Please ensure your Company name/Customer ID or Customer Username appears in the sender section of the wire transfer. 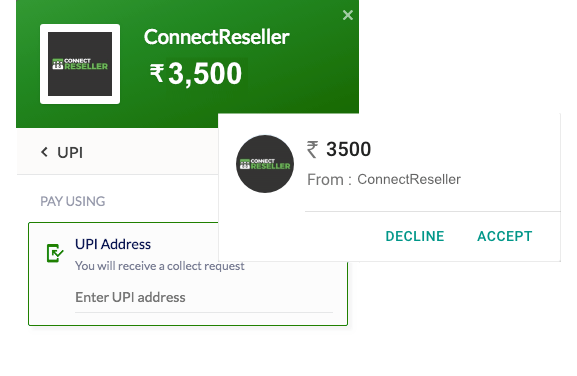 Once you send the Wire/Bank Transfer, send a mail to billing@connectreseller.com. In the email, include details of the Wire/Bank Transfer, Your Customer Username, your Company Name, Date of Transfer, Originating Bank, Transferred Amount, and your Bank Account Number. Only when we receive this information from you, we will verify your transfer and credit your account appropriately. Payments made via PayPal are charged: 2.9% + 30¢. The charge will be displayed as Payment OwnRegistrar, Inc.
Payments made via Net banking/Credit card through ccAvenue are charged: Upto 5%. UPI is a new mobile-first payment mode for making payments to friends or businesses. Razorpay was the first in the industry to bring UPI payments to merchants. Accept UPI payments without writing any additional code. Accept payments from all major credit and debit card networks like Visa, Mastercard, American Express and RuPay. Also get access to international card payments. With Razorpay Flash Checkout, your customers can save their card details and use them for future payments. Accept payments through 50+ banks including SBI, ICICI Bank, HDFC Bank, Axis Bank, Kotak Bank and Yes Bank. The bank page opens in a pop-up window so your customers can easily come back to your website, ensuring a great experience. Generate virtual accounts and accept payments via NEFT, RTGS and IMPS using Smart Collect. Get notified for each incoming payment and automate the tedious reconciliation process. Allow your customers to pay via popular online wallets like Mobikwik, Freecharge and Ola Money. They can approve payments using OTP directly on Razorpay checkout for a seamless experience. QualiSpace Web Services Pvt Ltd.
Name on the Cheque: QualiSpace Web Services Pvt Ltd.
Cheques non-payable at Mumbai will not be credited to your account immediately but only after the amount has been credited to our Bank Account. Demand Drafts or Pay Orders or Cheques payable in Mumbai will be credited to your account within 1 Business day. Payments made via All payment modes(except below) are charged: 1.75%. Payments made via Amex/International/E.M.I ( If applicable) card are charged: Upto 2.95%.